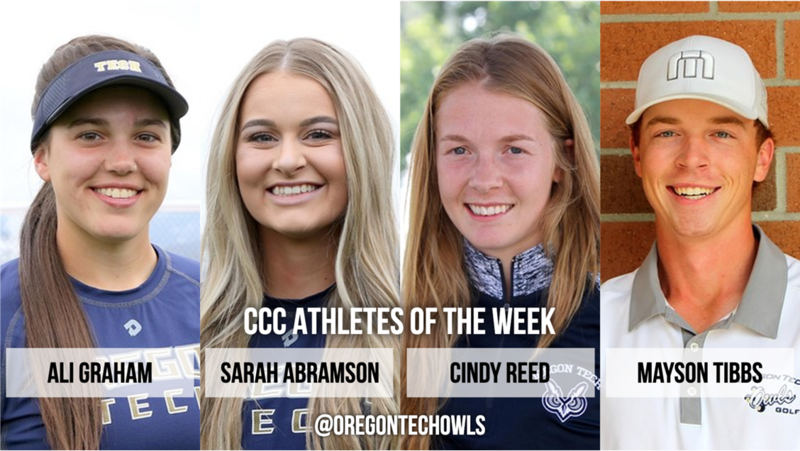 LA GRANDE, Ore. – Four Oregon Tech Athletes, Ali Graham (Softball), Sarah Abramson(Softball), Cindy Reed (Track), and Mayson Tibbs (Golf) have been recognized as Cascade Conference – Red Lion Players of the Week for their performances during the period March 25-31 the conference office announced. Graham had a monstrous weekend for the No. 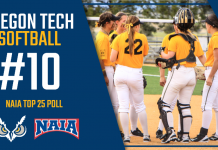 13-ranked Lady Owls, helping Oregon Tech to a four-game sweep of Northwest Christian. 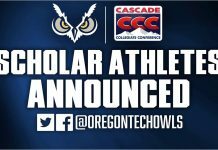 Not only did the senior from Chehalis, Wash. go 9-for-15 (.600) with a game-four homer at the plate, but she also threw a no-hitter in the circle during the Owls’ 2-0 win in the series’ opener. Oregon Tech sweeps this week’s softball Player of the Week honors, with Abramson (SO, Milwaukie, Ore.) excelling in the circle with a pair of impressive performances during the Lady Owls’ undefeated weekend. Abramson got wins in each of her two starts, allowing just a pair of runs in 12 total innings of work, and striking out a ridiculous 24 batters during that time. Competing at the Mike Fanelli Track Classic on Thursday, Reed (JR, Klamath Falls, Ore.) re-set her own school record in the 10K with a mark of 36:12.35 in the event, placing 23rd in a highly-competitive field of 62 athletes. She is now the national leader in the 10K, with her mark standing as the No. 1 time in the NAIA so far this spring. Tibbs, a sophomore hailing from Prineville, Ore., tied a school record with a tournament-low round of 65 in round two of the Desert Intercollegiate. His two-round total of 7-under-par 137 (72, 65) earned him medalist honors at the tournament, leading the No. 17-ranked Owls to a second-place finish, just two strokes behind No. 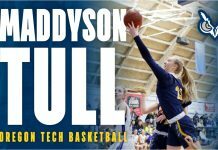 5 Texas Wesleyan.